A rescue plan for Sahara was thrown into disarray on Wednesday, when Spanish bank BBVA SAdenied offering a credit line to the bank, scuppering the conglomerate's claims it would use it to help secure bail for its jailed boss. Sahara, once one of India's most high-profile firms, told the Supreme Court this week that it had secured a 900 million euro ($985 million) line of credit from BBVA, one of several financial deals it said it had struck. The court allowed Sahara three more months to raise bail. Sahara's extravagant founder and boss Subrata Roy has been held in jail for more than a year, after Sahara failed to comply with a court order to refund billions of dollars to investors in a bond programme that was ruled illegal. Sahara has made several failed attempts to raise the bail money. The court has set Roy's bail at $1.6 billion, a product of the cost of the bond programme, estimated by regulators to be as much as $7 billion. Sahara has said it has paid most of the dues to the bondholders, but the Securities and Exchange Board of India disputes that. "We have no credit exposure or any relation with Sahara," a spokesman for BBVA said. A senior executive at BBVA separately told Reuters on condition of anonymity that the bank was never in talks with Sahara for a loan and that the mention of its name in the court proceedings was a "surprise". Sahara had on Monday submitted a letter in the court written on BBVA notepaper and signed by bank executive Jose Ramon Vizmanos, taking responsibility for the credit it was giving Sahara. On Wednesday, Vizmanos told Reuters from Madrid that he had no knowledge of the letter. "I have never worked with any Indian company ... The only thing I know about Sahara is the desert in Africa," Vizmanos said by phone. A Sahara spokesman did not immediately respond to an e-mail and phone call requesting comment. Sahara had told the court it planned to use the loan from BBVA to replace a loan from Bank of China (601988.SS) tied to its three overseas hotels, which include New York's Plaza hotel and Grosvenor House in London. Sahara has a debt of $852 million from the Chinese bank, the company lawyer told the court. Earlier this month, Grosvenor House was put up for sale, after Bank of China's loan, partly backed by the hotel, was declared in default. 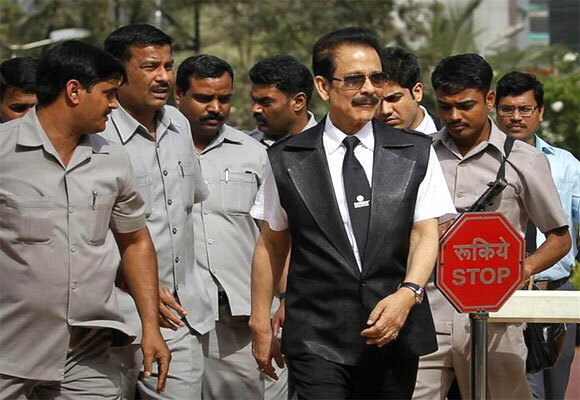 Sahara, a conglomerate whose assets range from Formula One to property and TV, has been trying to raise bail using its properties including Aamby Valley township outside Mumbai, which has luxury villas and a golf course. The company's talks with US-based Mirach Capital Group to raise $2 billion collapsed last month after Reuters reported that a bank letter underpinning the proposed deal was forged. The Supreme Court has said it could ask a receiver to auction Sahara's assets if it failed to raise bail. Roy, the company's founder, styles himself "managing worker" and guardian of the world's largest family. Several employees said operations across the group had been hit over the past year without him. He built the group from a standing start with just Rs 2,000 and a Lambretta scooter in the late 1970s, but later could draw the country's prime minister, state chief ministers, actors and cricketers to his extravagant parties. Roy is not only the face of the conglomerate, but also single-handedly controls an operation spread across dozens of tiny subsidiaries in India, Mauritius and Britain, several employees said. One year in jail: Is there hope for Subrata Roy?